If you're a fan of feta, we know that you'll love ricotta salata. Ricotta salata has an entirely different flavor. It's aged. It's firm. And it's saltier. Ricotta salata tastes a little like feta and it's just the cheese you need to elevate your recipes. And luckily, this is one of the more affordable cheeses. To make dressing: In a mini food processor or blender, add scallions, 1 teaspoon jalapeño pepper, cilantro, lime juice and salt; pulse to combine. Continue to process while adding olive oil. Once dressing is well blended, taste and adjust spice/heat level with additional jalapeño, being careful not to add too much at one time. In a small bowl, mix avocado with about half the dressing and set aside. This will prevent the avocado from browning. 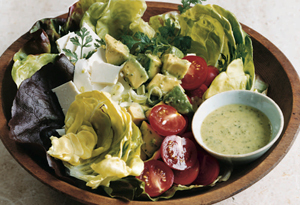 Assemble salad by arranging lettuce leaves in bottom of a large serving bowl. Add tomatoes, then cilantro leaves; crumble ricotta salata over the top and sprinkle with scallions. Place avocado in center; serve remaining dressing on the side. Garnish with shelled pumpkin seeds.